Desert plants are abundant across south and west Arizona, but a small number of species predominate, and the many rarer varieties require much more effort to locate in the wild. 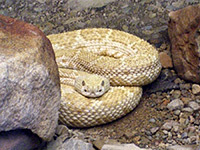 Animals are even harder to spot, and most are active at night or early morning, preferring to hide away underground during the heat of the day, hence zoos and botanical gardens provide the best way to view many species, and the premier site in the state is Arizona-Sonora Desert Museum, 12 miles west of Tucson. This contains about 300 animal species and 1,300 types of plants, nearly all native to the Sonoran Desert, which covers the southwest third of Arizona, far southeast California, and extends south into the Baja California peninsula and Sonora in Mexico (see map); around a quarter of the museum's plants and animals are found only in Mexico. 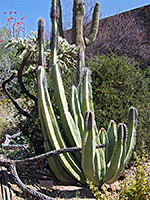 Elsewhere in Arizona are several other botanical gardens including Boyce Thompson Arboretum State Park east of Phoenix, which has a larger collection of plants originating from a wider area, but the Desert Museum has the premier collection of Sonoran Desert species, plus the added attraction of animals. The museum is situated in the foothills of the Tucson Mountains, along Kinney Road just south of the west section of Saguaro National Park, nearly opposite the trailhead for Gould Mine. The surroundings are quite densely covered with cacti and other plants, and across the park's 98 acres, many dozen species grow naturally and may be viewed along an unpaved, half mile trail, while all the exhibits and collections are arranged along a one mile paved path. The minimum time to see every exhibit, albeit briefly, and walk along all trails, is around three hours. A more leisurely tour that includes waiting for all animals to show themselves could easily last a full day. Opening hours are 7.30 am (8.30 am in winter, Oct to Feb) to 5 pm, extended to 10 pm on Saturdays in midsummer, while the entrance charge (2019) is $21.95 for adults and $8.95 for children aged between four and 12; rates are a little higher at some times during the winter. The museum is very popular and its large parking lot may hold hundreds of cars by mid-morning. 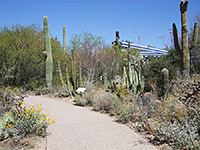 The entrance is attractively laid out, lined with numerous species of wildflowers, shrubs and cacti, some identified with notices, and including a few non-native plants like the large-flowered torch cactus (trichocereus). An old car is permanently stationed outside, the museum's logo on the doors; this dates from the early years of the establishment, which opened its doors 1st September 1952. The main buildings comprise a restaurant, cafes, education center, gallery, theater and gift shop, in addition to the various specimen rooms, all linked by a network of well signposted trails. Animal exhibits seem to be the most popular, even some of their residents are not always visible, but docents stage special demonstrations and viewings of some of the larger species. 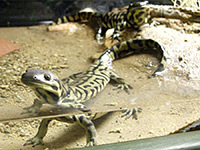 Reptiles and Invertebrates; a dimly lit enclosure containing several dozen species of snakes, lizards, salamanders, frogs, toads, scorpions, spiders and other insects, all easily viewable in glass tanks. Docents are usually present to answer questions and may have some non-venomous snakes available for touching. Mountain Woodland; example of a high elevation environment as found in the isolated mountains (sky islands), of southeast Arizona. Animals here include mountain lion, black bear, Mexican wolf (an endangered species), and white-tail deer. Desert Grassland; a collection of plants and animals of the grassy regions between the mountains and the low desert - animals on display here are prairie dogs, snakes and owls. Agave Garden; many types of agave, the majority native to Mexican regions of the Sonoran Desert though there are around ten species from Arizona. Many look very similar, but most are identified by signs. Cat Canyon; a large enclosure containing, grey foxes, cougars, ocelots and bobcats, all somewhat secretive and not easily spotted during the middle of the day. Desert Loop Trail; a half mile unpaved loop through mostly undisturbed Sonoran Desert landscapes on the south side of the museum, the same terrain found in nearby Saguaro National Park. 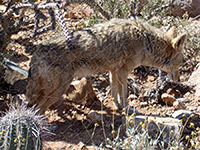 Along the way are a coyote enclosure, a small grove of palo verde trees, a javelina cage, a lizard area and a spur path to an overlook used for raptor demonstrations. 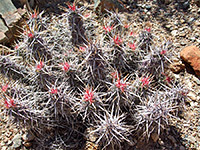 Cactus Garden; more than 100 varieties of cacti, of which about a third are Mexican-only species. Not all are named and a few are in poor condition but the collection is still impressive. 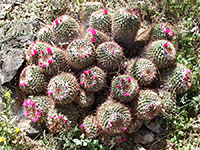 Major genera are ferocactus, echinocereus, opuntia and mammillaria. 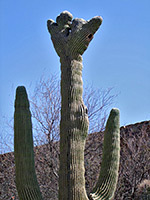 The garden includes the rare organ pipe and senita cacti, found naturally in Arizona only in the far south. Riparian Corridor; wetlands, pools and a short stream, home to beaver, otter, coati and a selection of fish. Nearby is a bighorn sheep enclosure. Walk-in Aviary; a large building containing about 14 types of birds, including quails, ducks and doves; next door is a pond with tortoises. Desert Garden; many trees, shrubs and wildflowers. Hummingbird Aviary; another walk-in enclosure filled with bushes and flowers and housing several species of hummingbird. Nearby are groups of plants favored by butterflies, moths and bees, plus a small group of yuccas, and a pollination garden featuring more colorful, scented flowers.